For starters, in case you’re new to the RV life, RVers are a friendly bunch. This surprised us when we first began to RV fulltime. After telling a friend about this strangeness, his reply was, “Of course they’re friendly. They’re all either retired or on vacation.” Well, we know now that retired or on vacation is not always the case, but it seemed reasonable at the time. Our slide wouldn’t retract. A neighbor came over to offer a hand and then he came back with his laptop so he could look up wiring schematics for us. We were watching a group of bocce ball players. They stopped to share the rules of the game and invited us to play a round with them. We were playing shuffleboard with friends and the group next to us (who could see quite clearly we were newbies to the game) told us they played each evening and then invited us to join them. 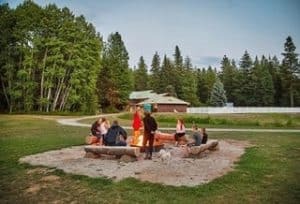 There is the standard way of meeting new people which is to participate in the RV park’s planned activities like card games, crafts, morning coffee, bingo, dances, etc. But we promised to give you a list of outside the box ways to find friends in the RV world. We have a motorcycle lift and we’ve struck up many friendly conversations as we loaded or unloaded the motorcycle. Other items can work, too, like a small boat, great truck rack, unique grill or even a satellite dish. We see quite a few flags that draw attention. American flags are, of course, a favorite here in the US, but military, state and Canadian flags are pretty prevalent, too. One man flew a Christian flag. He said people would stop to talk and ask about the flag. Relaxing in the spa brings out some great conversations with people you don’t know yet. We’ve talked about RV travel clubs, Mexican dental services, long-term RV sites, places to visit in the area, all while relaxing in the spa. When we walk around the RV park, we look at the set ups other people have in case we see something that might work well for us. Often we stop and say, “I hate to be nosey, but how do you like that or where did you buy that or how does that work?” Just yesterday, there was this great folding hammock stand we really needed to know about, so we asked, “I hate to be nosey, but where did you buy that? Is it heavy? Does it fold up small?” A friendly little conversation followed. Most every time we set up on a new site one of our neighbors will take time to visit for a short bit. (Don’t worry; most will know to cut the visit short once you begin the black tank hook-up.) And if your new neighbors are sitting outside (and not facing their RV, of course), give them a quick hello if they haven’t already walked over for a visit. 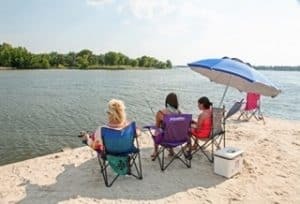 There are multiple RV groups you can join that plan trips together, hold annual rallies, have small groups focused on individual interests and set up sorts of opportunities to create friendships. Here are a few here in the US – Escapees, Good Sam Club, Family Campers & RVers, Tin Can Tourists and RVing Women. Once you find things you have in common with your new acquaintances plan a follow up activity. At one park, all new acquaintances were invited to a 4:00-6:00 pm bring your own chair hang out session. Each year we’ve seen that group grow. 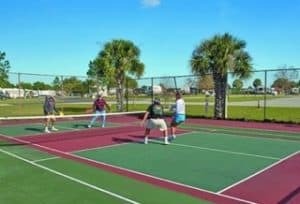 Schedule a paddleball game with them. Invite them over for an outside barbeque or a card game at the community center. Always keep your safety in mind, of course, as you would with anyone you don’t know yet, but be open to the possibilities of a new friendship.